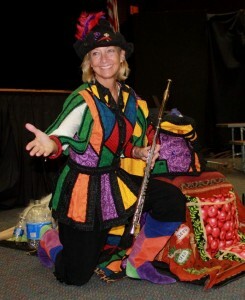 Donna’s Pied Piper Productions celebrate learning through the arts! Donna Wissinger is an internationally recognized concert flutist and arts consultant. Her work is based on the premise that learning is an affair of the heart as well as the mind, and that the arts are an essential component of inspired life-long learning. Ms. Wissinger is a principal of Creative Leaps International, a premier Florida and Southern Arts Federation Touring Artist, and engaged as an Artist-in-the Schools nationwide. She is the inaugural recipient of the Doris Leeper Award for Excellence in Arts Education. Donna Wissinger has been published as a poet, teaching artist and arts consultant in the US and UK. Click here to sample a few of her publications.